Either side of a foot of snow is expected in the Aspen area and Colorado mountains, according to a winter storm warning issued by the National Weather Service. The warning, which lasts until 6 a.m. Thursday, calls for snow totals of 8 to 14 inches, with the heaviest snow likely above 9,000 feet. The weather service said thunderstorms are possible with moderate to heavy rain in the lower valleys. The system pulling moisture from the southwestern U.S. will merge Wednesday with a much colder system dropping in from the northwest. “A strong cold front associated with this second system will bring snow levels down to mountain bases and some valley floors by Wednesday afternoon,” the NWS predicts. 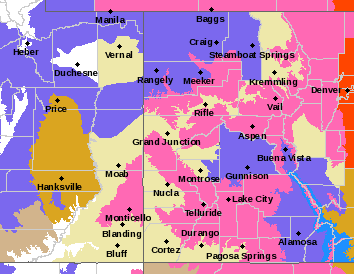 “The central and southern mountains will see the highest snow accumulations with 10 to 20 inches expected through Thursday morning and upwards of 2 feet or more in the San Juan Mountains. Combined with the storms from the past few weeks, the Colorado Avalanche Information Center has an avalanche warning (level 4 of 5) for Wednesday, and travel in the backcountry is not recommended. Many flights into and out of Denver International Airport, including those from Aspen, have been canceled. Travelers should check the airport’s website aspenairport.com or their airlines. Nearly all of the flights leaving or arriving to Aspen on Wednesday have been canceled. This story was updated at 2:25 p.m.
All Denver International Airport runways are closed and both directions of Peña Boulevard to and from the airport are blocked because of multiple crashes after 1,353 flights in and out of the airport already were canceled due to Wednesday’s bomb cyclone weather event. DIA spokeswoman Emily Williams said the airport is expecting anywhere from between 7 to 11 inches of snow. Wind gusts have reached 79 mph at DIA, according to the National Weather Service in Boulder. Southwest Airlines alone has canceled 372 flights or 90 percent of all its flights, according to FlightAware. SkyWest has canceled 204 flights or 73 percent of its DIA flights. Frontier, United, Trans States, GoJet, Republic, American Airlines, Delta, Spirit, Jazz Air, Alaska Airlines, British Airways, Lufthansa, Air Canada and JetBlue have also canceled flights ahead of the storm. A 56-year-old Aspen man charged along with his wife and son with giving cocaine to one minor and alcohol to several turned himself in Tuesday at the Pitkin County Jail, sources said. Joseph Lipsey III also posted a $100,000 cash-only bond at the jail and was released, said Deputy District Attorney Don Nottingham. Lipsey is charged with distribution of cocaine to a minor, the highest level drug felony available under Colorado law that comes with a mandatory prison sentence of between eight and 32 years upon conviction. He also faces three counts of felony contributing to the delinquency of a minor, three counts of serving alcohol to minors, possession of drug paraphernalia and providing nicotine to minors. Lipsey’s wife, Shira Lipsey, and son, Joseph Lipsey IV, were arrested Monday and charged with similar counts. All three are scheduled to appear in court April 1. What’s to take the place of the Safeway store on Grand Avenue when the current occupants leave in April is in question. The lot that Safeway has occupied since the 1990s has not been sold, but a spokesperson for Albertsons Cos. said the company would be putting the property on the market. “We have not sold the property, we are marketing it though,” said Kris Staaf, director of public affairs for Albertsons and Safeway public affairs. Last week’s announcement of Safeway’s impending closure did renew a local movement to petition Trader Joe’s to move to Glenwood Springs. Over the past several years, some residents of Glenwood Springs and surrounding towns have posted links to the petition on various Facebook community groups. Trader Joe’s is a national chain of specialty markets that uses a direct-buy model with its suppliers as a way to keep customer costs down, according to the company’s website. There are seven Trader Joe’s stores in Colorado, according to the site. All of them are on the Front Range. The petition “definitely is the first part” of Trader Joe’s calculus for opening new locations, said Kenya Friend-Daniel, national director of public relations for the chain. “We definitely want to be in areas where we know we’re wanted, and where people want a Trader Joe’s,” Friend-Daniel said. Trader Joe’s does not release information on how many people have submitted the petition, and there isn’t a magic number of submissions the company has to reach in order to consider opening a new store. “Our real estate team looks at each and every request,” Friend-Daniel said. They determine how much people want the store, whether there’s a good location available, and if there’s a strong local workforce, she said. Safeway had been at the current location, at 2001 Grand Ave., since the 1990s. In a statement, the company indicated that the business wasn’t working well enough. The south end of Glenwood Springs now has one dedicated grocery, the City Market store a few blocks north at Grand Avenue and 14th Street, and a partial food selection at Walmart. A spokesman for King Soopers/City Market said the company has no plans to relocate the Glenwood Springs store. Glenwood Springs can support another grocery store, and should have more options as a regional shopping hub, Assistant City Manager and Economic Development Director Jenn Ooten said. Glenwood Springs captures a lot of consumer spending on groceries from both regional travelers, and from visitors, according to a 2018 Business Opportunities study commissioned by the city. The report showed that “people are driving from other places” to buy groceries, Ooton said. As a business along Highway 82, and at a traffic light, the Safeway property is a prime location, she said. The Safeway property “was identified in the comprehensive plan as a possible area for a mixed-use neighborhood,” Ooton, who also is the city’s community development director, said. For now, the city is waiting to see who is interested in the property, and plans to discuss possibilities with any businesses that are interested in moving in. Ultimately, Albertsons will evaluate the best offers. “There are potential retailers who we will reach out to and see if there’s any interest in the property, but it’s Safeway’s brokers who will evaluate the property,” Ooton said. An Aspen teen and his parents were charged Monday with giving cocaine and alcohol to underage high school students during parties at their home near Aspen Highlands, according to court documents. Joseph Lipsey IV, 19, and his mother Shira Lipsey, 44, turned themselves in Monday morning at the Pitkin County Jail, where they were arrested on numerous charges including felonies. Both were released after each posting $100,000 cash-only bonds. Lipsey is the same teen charged in January with two counts of felony vehicular assault after he was alleged to have been at the wheel of a Tesla sport-utility vehicle in November that flew off Maroon Creek Road, injuring himself and four other local high school students inside. Lipsey’s father — Joseph Lipsey III, 56 — also faces charges connected to the alleged parties thrown at his home, said Aspen Deputy District Attorney Don Nottingham. Both parents were charged with distribution of cocaine to a minor, among other charges, which is considered a Class 1 drug felony under Colorado law. If convicted of just the distribution charge, each parent would face a mandatory sentence of between eight and 32 years in prison, Nottingham said. Their son faces two counts of distribution of drugs to minors, among other charges, though those counts are Class 3 drug felonies because he was less than two years older than those he allegedly provided drugs. A message left on Shira Lipsey’s cellphone seeking comment Monday was not returned. Her son’s Eagle-based attorney also didn’t return a phone message Monday. Evidence collected by investigators from both the Pitkin County Sheriff’s Office and the Aspen Police Department includes cellphone Snapchat videos shot by an Aspen High School student that allegedly show Shira Lipsey sitting in front of a plate featuring “a pile of an unknown white powder,” according to the affidavit. Another video allegedly shows Shira Lipsey, her son and an unidentified man sitting on a couch in front of a table featuring a white-powder dusted credit card, a rolled-up dollar bill and three green straws, one in front of each of them. “Before sending the photo, the user put the text, ‘This kid’s parents are tryna kill me,’ on the screen with the video’s image,” the affidavit states. Those two videos were both time-stamped about 2:45 a.m. on Jan. 3. A third video — shot at 3:45 a.m. on Jan. 3 — shows the same plate in the first video with a “pile of white powder,” along with the same credit card and a green straw on the table. Before sending out that video, the user typed the text, “Almost did it all” to go along with the video, according to the affidavit. And while none of the videos explicitly show the Lipseys giving cocaine to a minor, other high school kids saw the plate of cocaine upstairs at their home that night, and one allegedly saw the Lipseys and their son pass the plate to a minor, who inhaled “some lines,” the affidavit states. That story came from the mother of an Aspen High School student, who did not want to speak to police for fear of being labeled “a snitch,” according to Shira Lipsey’s arrest warrant affidavit. The mother said her son told her he was downstairs at the Lipsey home the night of Jan. 2, when he and others realized one of their friends was missing. They went upstairs and saw their friend sitting at the dining room table with the Lipseys and a younger couple, the affidavit states. The woman said her son told her that when he saw the incident, he “felt like throwing up” and “didn’t know what to do,” the affidavit states. Finally, in a search of the Lipsey home Feb. 19, police officers and deputies found “a collection of items … likely to be used” for freebasing or smoking cocaine that included charred tin foil and a crystalline powder-caked spoon, baggies of white powder that tested positive for cocaine, numerous pills including Xanax and Alprazolam that didn’t accompany prescriptions and codeine syrup, according to the affidavit. The investigation into the Lipseys grew out of an Aspen police investigation into the Jan. 2 burglary and theft of alcohol from the Mountain Chalet lodge in downtown Aspen, and related vandalism at another hotel, Nottingham said. Two of the three Aspen teenagers arrested in connection with that case were also at the Lipsey home the night of Jan. 2, according to the affidavit and law enforcement sources. Those two teens and several others told police about being at the Lipsey home on different occasions when underage kids were drinking in the presence of the Lipsey parents, according to Shira Lipsey’s affidavit. One said he’d seen Joseph Lipsey III unlock a liquor cabinet, distribute alcohol to minors and “make statements such as ‘be safe, have fun,’” the affidavit states. The minor who made that statement was at the Lipsey home the night of Jan. 2 and said he saw the plate of cocaine while he was upstairs, secretly filmed it and the men sitting in front of it and sent the video to his friends on Snapchat. Another minor told police he saw Joseph Lipsey III carry the plate of cocaine into the living room that night, and saw people sniff the drug while about 15 high school-age kids were in the home, the affidavit states. A third teenager at the home Jan. 2 also told police he saw the yellow plate of cocaine on the table, according to the document. One of those teens also said he has ingested Xanax, MDMA and a drink called Lean, which generally contains codeine syrup, all of which he received from Joseph Lipsey IV, according to the affidavit. Joseph Lipsey IV is charged with two counts of felony distribution of drugs, felony contributing to the delinquency of a minor, four counts of possession of a controlled substance, three counts of possession or consumption of alcohol or marijuana by a minor, possession of drug paraphernalia and furnishing tobacco or nicotine products to minors. Joseph Lipsey III had not yet been arrested as of Monday evening. His wife and son were released from the Pitkin County Jail about 40 minutes after they were booked Monday morning when a family associate arrived with $200,000 in cash, according to DiSalvo. Shira Lipsey is charged with felony distribution of cocaine, three counts of felony contributing to the delinquency of a minor and three counts of serving alcohol to a minor. The exact charges for Joseph Lipsey III were not available Monday. “The Lipsey family has few local connections to the community,” according to the affidavits for Shira Lipsey and her son. The family owns a spring water company based in Atlanta as well as several other businesses, the affidavit states. The Lost Cajun’s Glenwood Springs location announced on Mardi Gras Day, March 5, that it was closing. The Glenwood Springs location for the chain restaurant that started in Frisco posted on its official Facebook page, “It is with deep sadness and great regret that we announce that The Lost Cajun Glenwood Springs is now permanently closed. Raymond Griffin of Barataria, Louisiana, opened the original Lost Cajun in Frisco, Colorado, in October of 2010. Since then, the restaurant that specializes in serving popular Cajun cuisines such as gumbo, red beans and rice, crawfish etouffee, and beignets turned into a franchise and today has over 20 locations, predominately in Colorado and Texas. The Lost Cajun in Glenwood Springs has been located near the plaza beneath the Grand Avenue Bridge and had been in business since May 2014. The Lost Cajun’s company office did not return a request for comment. Ryan Zabik climbed in his ski boots 50 feet up through the avalanche path to where his friend George Micah Woods rested. Then Zabik snapped the selfie that will stick with the skiing duo for a lifetime. It’s a snapshot in time that provides a glimpse into Friday’s in-bounds avalanche at Breckenridge Ski Resort. The foggy, out-of-focus cellphone picture showcases the 30-year-old Zabik smiling into the camera from underneath his ski goggles while his pal Woods, 31, smiles from a seated position a few feet upslope. Next to Woods, a Breckenridge ski patroller is at his side to help him. And, in the distance above those three, the afternoon sunlight over the Ten Mile Range illuminates the probe-line portion of the search and rescue effort conducted by the resort’s ski patrol in the wake of the slide. The duo from Michigan was here on their annual ski trip with family and friends. For the past five years, their group has generally come up for four days — flying in on a Wednesday, skiing Wednesday through Saturday, and flying back Sunday. Friday’s avalanche, though, threw a different experience into the annual vacation. The duo estimated the avalanche was 50 to 100 yards wide and 300 to 400 yards long. Reflecting on the avalanche, the duo still wasn’t sure if they triggered the slide or if it was another skier or rider above them. Maybe they had, maybe they hadn’t. Either way, they said it occurred at 12:15 p.m., while they were traversing from the top of the Imperial Express SuperChair, North America’s highest lift, to their desired above-tree line ski terrain destination: Whale’s Tail. Whale’s Tail is a location both had skied before. The lifelong, more experienced skier Zabik had made the traverse dozens of times, while the more intermediate skier Woods had done it a few times himself. In fact, on Wednesday and Thursday of this week, Zabik and Woods both described the skiing at Breckenridge as perhaps the best of their life. This week’s epic powder provided lifetime memories for years to come of skiing off of the T-Bar and off of Peak 6’s above-tree line Kensho chair. It all came without a hint of a reason to be worried about an avalanche. The thought truly didn’t cross either of their minds until Zabik felt the ground move from beneath his skis during that traverse to Whale’s Tail on Friday at 12:15 p.m.
After they rode up the Imperial Chair together, Zabik described the conditions above 12,000 feet as typical to what he’d experienced there before: Strong gusts, moderate to limited visibility — the usual. Zabik estimated he and Woods were among the first 100 skiers and riders who attempted the traverse from Imperial Chair to Whale’s Tail. About an hour before, Zabik diligently checked his phone to see when Breckenridge would open the lift. Once they did, they raced over before waiting on a 25- to 30-minute lift line at the bottom of Imperial. Zabik said he and Woods were about 200 to 300 yards into their traverse — about three minutes from hopping off the chair — when he noticed the avalanche. A split-second later, he too was sucked into the avalanche. He thought to himself that he didn’t know how to react for this. Should he swim? In the moment, he hoped for the best, thinking to make his body limp with the idea it could prevent him from breaking any limbs — his gravest concern. Further down slope, Zabik said the slide engulfed his skis, sucking him down pretty quickly up to about his waist. At that point, he said he did his best to arch his back and throw his arms out to try and stay on top of it. But, because he was positioned semi-vertically within the slide, Zabik felt the snow continuing to grab a hold of his skis, pulling him down further. He compared the feeling to quicksand. At that point, he thought it’d be best to lose his skis. Trying his best to position himself to have his bindings release his skis, the avalanche soon ripped them right off. Time distorted the experience for both skiers, though they guessed it lasted 10 seconds from start to finish. Once it stopped, both Zabik and Woods had somehow managed to float back up to the top of the slide, both of them in a seated position with snow up to their waists. They said where they came to a stop was about 150 yards downslope in a portion of the resort a ski patroller told them is known as the “Shadow Bowl.” The avalanche’s debris field didn’t carry them all the way down to where the debris itself came to a stop. Once he came to a rest, Zabik immediately called up to Woods, paranoid of a secondary slide of some sort. Zabik didn’t move until ski patrol reached Zabik, which they said was five minutes after the avalanche occurred. Both Zabik and Woods described their interaction with the resort’s ski patrol as great. They were asked all sort of discovery questions immediately, including whether anyone else was involved. The duo told the ski patroller they were not sure. In a press release issued Saturday afternoon, Breckenridge spokeswoman Sara Lococo said a total of five guests were involved in the slide and that no guests were injured or required rescue. Ski patrol eventually cleared the area at 1:54 p.m.
Zabik and Woods also realize it was rare. They said the ski patroller who attended to them told them that in his 30 years in ski patrol this was only the third instance of something like what they experienced. After they stayed put at the scene for what they estimated was two hours, the resort’s ski patrol took them out on a snowmobile. A debriefing and statement process followed at a ski patrol station before they downloaded a lift to the base of Peak 8. They said the resort’s guest services then took them down to the resort’s ski rentals to have them outfitted with new equipment — only three of their four skis survived the avalanche — for free. To cap the day off, they said the resort bought them a round of drinks at the TBar restaurant. When Zabik and Woods returned to ski the resort for a few hours on Saturday, Zabik wasn’t quite ready to head back up Imperial. But, at some point, he’ll return to the spot that gave him the wildest ride of his life. “I figure I have a score to settle with the mountain,” he said with a laugh. According to a Colorado Avalanche Information Center preliminary report, the first accident on March 8 involved a property manager who was shoveling a client’s property. He had just finished clearing a sidewalk when snow fell from a roof above him, catching him in the avalanche and burying him. He was buried under 2 to 3 feet of snow on the shoveled sidewalk, which acted like a small terrain trap and allowed the debris to pile deeply, the report states. The Associated Press identified the man as 28-year-old Alex Theaker. Theaker was buried for about two hours before his girlfriend went to check on him when he did not arrive for an appointment. She found the debris pile and called 911, and Crested Butte Fire Department found and excavated him. He was found unconscious and hypothermic but had a “basketball-sized” airspace near his face, created by a bent arm. The man was transported to a hospital and released the following day. In a second incident on March 9, two men were clearing snow from the roof of a commercial building when the snow avalanched, burying both men in the slide. The Associated Press identified the two men as 25-year-old Stephan Michael Martel and 37-year-old Blair Tulliver Burton. The CAIC report states no one witnessed the slide, but about 10 minutes later someone discovered the avalanche, called 911, and began digging. Burton was dug out and taken to a local hospital. Martel was located by probing, and was not breathing when dug out. Martel was pronounced dead after arriving to the hospital. The two were buried for 20 to 30 minutes. An avalanche off Highlands Ridge over the weekend deposited tons of snow in Conundrum Creek Valley, snapped hundreds of mature trees and threatened a house. The avalanche broke over a mile wide and ran more than 3,000 vertical feet downhill, CAIC estimated from aerial observations. Lazar said it started just outside the boundary of Aspen Highlands ski area. The slide went down two popular backcountry ski routes off Highlands Ridge — K Chutes and Five Fingers. It likely slid across the vast area all at once, Lazar said. Officials believe it was a natural releasing avalanche that occurred sometime late Friday or early Saturday. The snow and debris fell with such force that it kept going once it hit the valley floor, traveling a couple hundred feet up the east slope then spilling downvalley. A house at the end of Conundrum Creek Road sustained damage from the slide but was spared from obliteration by an avalanche retaining wall built in the shape of a protective wedge. The chimney was knocked askew and fir and aspen trees planted outside were snapped off and bent over from the force of the snow. The house is about 7 miles southwest of Aspen. A property manager was checking the condition of the home Sunday afternoon and said the owners were not in town at the time of the avalanche. The avalanche decimated the trailhead for the Conundrum Valley Trail, a popular route to Conundrum Hot Springs. The parking area used to be surrounded by trees. Not anymore. “The Conundrum trailhead as we know it is gone,” said Glenn Horn, a resident of Little Annie Road on the east side of Castle Creek Valley. He visited the Conundrum site Saturday. “I’ve lived [in Little Annie] since 1985, and it’s the biggest avalanche I’ve seen,” he said. Lazar said there have been numerous large slides throughout the Colorado mountains after a prodigious storm cycle. In the Aspen zone, the storm dumped 5 feet of wet, heavy snow and produced about 5 inches of water equivalency, according to CAIC. “Slopes such as Highlands Ridge simply hit a breaking point with so much snow,” Lazar said. The slide buried a long stretch of Conundrum Creek but it was flowing near the confluence with Castle Creek on Sunday. The Five Fingers/K Chutes slide dwarfed the avalanche that covered Castle Creek Road at mile marker 4 on Friday night or Saturday morning. Deep snow sloughed off the steep road bank and buried the road in several feet of snow. It was reported by a technician for Holy Cross Energy who was responding to a report of a power outage in Conundrum Creek Valley. The road was fully opened by 8 p.m. Saturday. Officials from CAIC surveyed the Castle Creek Road corridor from a helicopter Saturday. They decided with the help of a snow safety officer with Aspen Skiing Co. who lives in the neighborhood what areas should be targeted with explosive charges to try to trigger avalanches. Lazar said the intent was preventing larger, natural slides that could cover the road and threaten utilities. A firm called Telluride Helitrax was enlisted to drop 10 15-pound explosive charges on avalanche paths, according to a news release from Pitkin County. No slides were triggered, Lazar said. A slide out of Maroon Bowl into the Maroon Creek Valley floor temporarily plugged the creek at the beginning of the storm cycle, Lazar said. The blockage affected the city of Aspen’s water intake for a short time. City officials were concerned that a slide in Castle Creek Valley would plug that creek as well. It is another intake for the municipal water system. Lazar said the slide that blocked Castle Creek Road temporarily plugged the creek, but it soon flushed through the snow. The avalanche danger for the Aspen zone remained at “high,” or a level 4 out of 5, on Sunday and CAIC issued an avalanche warning. “We wanted to go at least one day without a landscape changing event” before easing the warning, Lazar said. Even when the rating decreases to considerable, the size of the avalanches will undoubtedly kill a person, he said.